Professional roof repairs, maintenance, new roofing, and leak repair services in litchfield by Arizona Roof Rescue. Litchfield is a small community in Maricopa County. Residents love being able to know their neighbors and to feel like they are part of a tight-knit community. Many move here to raise families away from the anonymity of the big city of Phoenix. If you want to make your home in Litchfield, you’ll need to take good care of your home so that it will stay in top shape for the long haul. Your roof is one of the most important components of your home. Arizona Roof Rescue can help you maintain or repair your roof, or to replace it with a new roof when the time is right. Whatever your roof needs, our professional and experienced team can provide it. For almost four decades, our company has provided professional commercial roofing services and leak repairs for all types of roofs, including popular shingle roofs, tile roofs and foam roofs. We can perform regular inspections to provide ongoing maintenance and make recommendations for repairs as needed. By keeping to a consistent maintenance schedule, you will keep your roof in good health while also lowering your overall expenses. If you roof is aging out, an experienced roofing contractor from our team can help you select the right new roof for your home and install it. Whether you need maintenance or a whole new roof, we are committed to your total satisfaction, and we will perform the highest quality workmanship while also delivering friendly service. 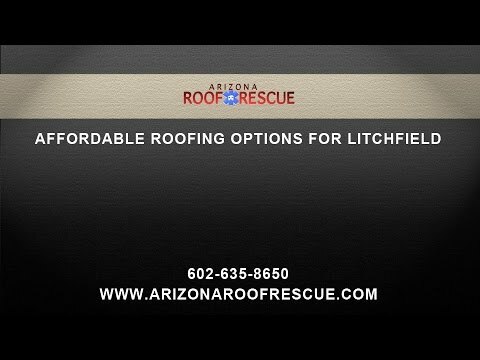 Contact Arizona Roof Rescue for your emergency roof repair or to hire a Litchfield Arizona roofing contractor to install a new roof for your home. All of our contractors are certified and have years of experience in the industry. Get the professional ,friendly service you need to keep your home in top shape and make sure you enjoy many more happy years in Litchfield. We service areas in Litchfield 85340 as well as in most parts of Arizona, give us a call to learn more! Does My Roof Really Need Cleaning? Headquartered On The Litchfield Glendale Boarder!